Success is a journey, not a destination, and it is measured by far more than money and mile markers. But what is success, really? How do you know whether you’re on the right path? What is goal setting, and why set goals? What is motivation, and how do you stay motivated? How do you define these factors? Better yet, how do you know when you’ve “arrived”? Join top experts with various viewpoints on the subject of success and chart your course to a better life. 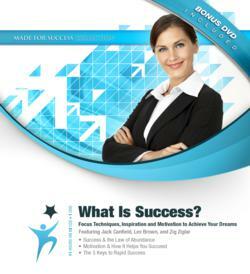 In this program, you’ll learn how to define the factors of success. You’ll learn the most reliable, easy-to-understand motivation theory, and you’ll learn what it takes to write and use vision statements that work. You’ll also be able to hypnotize yourself to achieve any goal—starting today! Let this troupe of New York Times bestselling authors help steer your course to success in school, business, and family life.